It's Monday 2 September 2002. We're leaving the playa. I'm writing this while Ranger Lefty is guiding us toward the Exodus gates. I just returned my radio after twenty-two hours of being "on". Last night's duty shifts morphed into events handled today, which in turn continued on through the swing and graveyard shifts. I'm so excited by what we accomplished that I want to write it all down before it drifts away. I'm exhausted, giddy, dusty, and sad to be leaving. Please excuse anything nonsensical; let me know so I can add clarity. This is a first-person chronicle of a day and night in the life of a Black Rock City Ranger. 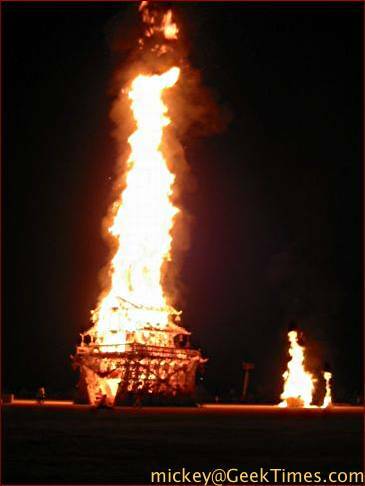 We're a non-confrontational group who mediate conflicts and encourage personal safety during the Burning Man desert event. As Jay Schneider one said: "[Rangers] do their best to stay unobtrusive. They are always there when needed but remarkably hard to find if you just want to point at one." The tale of this series of shifts started for me while patrolling with Ranger BB. It's the morning after the Man burned. On the Esplanade we encountered yet another vehicle driving in the pedestrian-only zone. As we'd done during dozens of other encounters, we requested that the driver drive on the other side of the lamp poles, twenty feet closer to the man. There they'd be on the playa, and not interfering with, and endangering, pedestrians. Unlike the rest of the drivers, this one became extremely agitated. "You've wasted ten minutes of my time!" he shouted, as he jumped out, placing his face inches from mine. Thankful that protective eyewear was shielding my eyes from a rain of spittle, I noted the Staff sticker and the man's heavy block dress, tattoos, and exceedingly poor syntax. The Rangers met eyes, shrugged. At an appropriate moment in the tirade I mentioned that a quick turn of his steering wheel to the left would have sufficed to protect the pedestrians from his large, rapidly-driven car. "I have a job to do! Rangers can't keeps stopping me! I'm very important!" Be that as it may, participant safety is paramount, and nobody is exempt from mindfulness. A staff sticker entitles one to drive in the performance of ones duties, but not in a pedestrian-only zone. I was interested to hear that other Rangers had stopped him for the same behavior, but not surprised. This one was pretty wrapped up in himself. "I'm going to call your boss! You're going to be in big trouble!" Shrug. After trying to get me to use my radio to call his boss to berate my boss, and my explanation that his chain of command and mine were on different frequencies, a glimmer of understanding appeared. He jumped back into his car and directed more spittle towards his radio. After a few minutes of screaming he proudly announced his boss was coming over. BB and I chatted, a few feet away. Reality check. We're still in Wonderland, right? A golf cart arrives. The driver, a woman, endures his jumping and screaming. I mention that we're in a pedestrian zone, in which nobody is allowed to drive, and that we'd be more than satisfied if he could keep his car twenty feet closer to the Man, out of the pedestrians way. She looked at him, said "drive out there", and left in a puff of dust. He looked at me. "We should settle this in the Thunderdome, just you and me!" Should mention that violence is the last refuge of the incompetent? Uh, probably not. Wouldn't be appreciated. We continue our patrol, strolling up the Esplanade. Later I make mention of the incident to my shift commander. Little did I know this wouldn't be my last encounter with this charming gentleman. A few hours my shift ends. I swap batteries, sign out, but keep the radio on while continuing to walk around the city. Un-patrol. Under the shade structure in front of Ranger headquarters I find Ranger Norman. We had a great time on the burn perimeter last night and during the patrol shift we shared afterwards (in spite of the lengthy time handling an ugly domestic violence incident; working with our medical, psychiatric, and Zebra - law enforcement liason - members was gratifying). Norman held a large, translucent plastic tub towards me. "Mom's cookies," he said. Huh? I popped open the lid and was rewarded by the gratifying smells of home and hearth. Chocolate chip cookies with coconut and other goodies. Oh, joy! Norman's Mom, if you're reading this, please know your cookies brought playa-free joy to many, many Rangers. I saw that cookie tub being passed around at several meals and during a few meetings at Ranger headquarters. Thank you very, very much. Each year, on the day following the Man burning, the Rangers remaining on the playa gather at headquarters for a short graduation ceremony. Year pins are then distributed, for display at future events. For many years I've missed this important moment because we've driven away in the wee hours after the Man's burn. This year our schedule let us stay thirty-six hours afterwards, so we could participate in the graduation and the burning of the Temple of Joy. At 1700 we met, hiding under the shade structure from yet another day's hot sun. Ranger Bob gave an excellent speech, both touching and rousing. (Every year with Bob is is a privilege.) A small group, perhaps four or five, were immediately thereafter sent to the Temple of Joy, to prevent any malcontents from trying to ignite it early. The rest of us were sent to pack and eat. It's hard to change into evening attire, for cool to cold weather, when it's still hot and baking out. But I did it, complete with almost 150 feet of EL wire and thirty-six 2000 MaH NiMh batteries. Added to that light output are two Photon lights - seen as the red splotch - and my 1997 luminescent Ranger badge. There'll be no missing me in the darkness. Then we waited for the commissary to open. (Have I mentioned how frustrating it is having our shifts conflicting with their operating hours. Must fix. Grrr.) Ten minutes before our reporting time the pork loin & chutney was ready. I used the radio to tell Shift Commander Bob that a bunch of us would be a few minutes late. Dinner was great. More of Norman's Mom's cookies. Our stomachs full, we gathered at headquarters and proceeded past the remnants of the Man. We planned a 900-foot perimeter around the Temple of Joy, much larger than the one around the Man. It took us longer to get organized and in place, but after all was done I was once again between Rangers Lefty and Norman. My section of the perimeter included the fire engines (and the firefighters, including several in all-encompassing silver isolation suits). The crowd was pleasant and cooperative. David Best, the designer of the Temple (and last year's Mausoleum), strolled around, chatting with the Rangers. He handed out some pendants, burned out of plywood, just like the Temple. He stroked the left side of the cutout of the Man - "this is for past burns" - and then the right side - "this is for future burns" - and then the head - "and this is for being in the moment" - before he handed the pendant out and moved on to repeat with another Ranger. Accelerant was added to the structure, and it burned high and hot. Very hot. Just at the peak of the burn a half-dozen extremely intoxicated individuals decided it was their turn to be in the fire. It was just our luck that it was in our segment of the perimeter. We held them back two or three times. The most drunk of the bunch made it past us, but was intercepted by a silver-clad firefighter. My skin was uncomfortably hot several hundred feet further away; I don't want to know what feedback wasn't working on this guy. Finally, after a bit of a delay, it was decided to let the perimeter go. Then we headed back out on patrol. I picked up my bicycle and headed out onto the playa. The event was clearly winding down; cars could be seeing heading out toward Gerlach. Still, there were a lot of people on the Esplanade. I headed out to Thunderdome and watched three or four matches. Great theater, and really great characters (some of whom didn't seem to be in costume). I heard a radio call asking for a medical evaluation at a nearby theme camp. I called in, explained my prior emergency medicine qualifications, and was given permission to head over. On a couch overlooking the Esplanade I met Jared. A friend explained "he's had some mushrooms, a lot of alcohol, but not much to eat." She didn't mention what alerted them to his current hypothermic state, but I was happy she did. He was really unresponsive, but not in any imminent danger (not that I could do much with a tiny fanny pack of gear). I called in, and a REMSA (Reno Emergency Medical Services Association) ambulance headed out to my location. 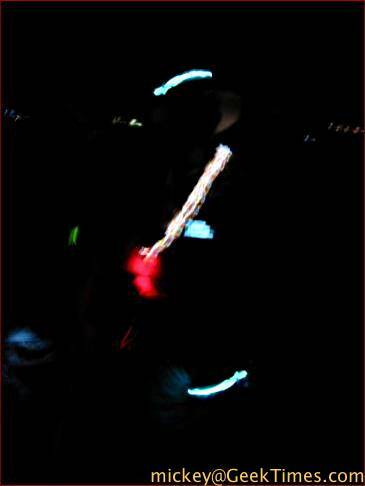 Ranger Big Bear arrived first; I guided him in so his headlights illuminated the scene. It took a few tries, but the REMSA rig found us, parked, and attended to Jared. I requested to be relieved, and passed on the name of the medic in charge. Granted. Back out onto the playa. I continued on toward the 90° edge of the city. Standing out from all the other reckless exuberant driving was a huge tractor-trailer semi cab. It towered over me. I rode along side and then asked him to stop. He was very polite as I asked about his [obviously non-art] vehicle. He said he was lost, and what with all the landmarks being burnt, I believed him. He followed my directions to the next intersection and headed off the playa. I called in a report of the vehicle particulars, and was still watching his taillights, when Ranger Big Bear called back to ask that the driver be detained; he'd already been evicted from the city three times this week! Out of my reach, and just out of sight! I raced after him, turning the corner in a cloud of playa dust, but he was nowhere in sight. After a few hundred feet I was at an intersection; no luck. He must really have been driving quickly. Downed, I called it in, but kept an eye open for him. I continued on my way, bicycling here and there across the playa. I saw a BLM (Bureau of Land Management) SUV start to drive from a vehicle stop. Getting nearer, I was flagged down by a laughing citizen. "I had to tell someone," he said. "That art car was driving much to quickly, so the BLM got behind him and ordered him to 'pull over'! Pull over, on the playa!" Ranger Rabbi joined us on our bicycle trek into the darkness. Navigation was a challenge, without the landmarks which had served us so well this past week. We arrived to find a camp waiting to drive away but loathe to leave one member behind. That member, though, was loathe to leave behind his supportee. Nobody at her camp was taking her seriously, and she didn't want to be "alone" until morning, when they were planning on leaving. She didn't even want to speak with us; scared of having her emotional scaffolding collapse, I guess. We turned off our radios, worried about spooking her. Ranger Rabbi took the big picture from a few meters back, radio chattering quietly. Ranger Norman was site security from a few meters on the side. I chatted with the supporter. He seemed exhausted, she seemed inappropriately needy, and the others just wanted to start on their way, having already been waiting for hours. After some negotiation, we escorted them back to her camp, to find her campmates there but uninterested in tolerating her drama any longer. We offered secure lodgings at the Ranger headquarters, but she wanted nothing but to stay with her supporter. He liked the attention and the power, and was vested in taking care of her, but he was torn between leaving her and making his friends wait any longer. Finally, and this is making a very long story very short, he took minimal supplies and legal tender and decided to stick it out with her, letting his friends drive off. We escorted them back to her camp, made sure they had a light, her bags, and someplace to sleep. Hours into this call, we returned back to headquarters. Rangers Rabbi and Norman headed off to bed. I was too energized to call it a night. I reported the details to the shift commander and asked permission to continue on patrol. Permission granted. New radio battery. Not too many Rangers on graveyard shift.